What is likely the worst industrial accident in Massachusetts history occurred on January 10, 1860. A large mill located in Lawrence collapsed without warning, and resulted in the death of more than 120 people (one source places the death toll at 169, with 134 people badly injured). The Pemberton Mill building was five stories high, 84 feet wide, and 280 feet long. This huge structure was only 7 years old when it collapsed. The cause of the disaster was determined to be faulty iron pillars which supported the floors, and under-strength mortar which bonded the brick walls together. 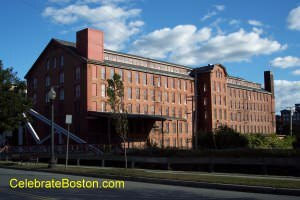 The 1862 Boston Almanac describes the accident: "The Pemberton Mills at Lawrence, Mass., through a defect in the cast-iron columns supporting the interior of the building, fall-in while nearly 800 operatives are at work, and bury many in the ruins. About four hours after the fall, a fire breaks out, and destroys those not extricated from the ruins. More than 115 people perish by the awful catastrophe, and 165 are more or less injured." After the destructive Lawrence Tornado event of 1890, the July 26, 1890 edition of the Boston Globe tells of the 1860 Pemberton disaster: "The scene after the fall was one of indescribable horror. Hundreds of men, women, and children were buried in the ruins. Some assured their friends that they were uninjured, but imprisoned by the timbers upon and about them. Others were dying and dead. Every nerve was strained to relieve the poor unfortunates, when, sad to relate, a lantern broke and set fire to the wreck. In a few moments the ruins were a sheet of flames. Fourteen are known to have been burned to death in the sight of their loved ones, who were powerless to aid them." Many of the workers were Irish immigrants. The Belles of New England by William Moran (2002) describes the last moments of a worker that tragically lost her life that evening: "Flames spread rapidly, and now terror of fire threatened those waiting to be saved. Mary Bannon, pinned in the wreckage, handed her pay envelope to the friend comforting her and asked that it get to her father. 'Bid him goodbye for me,' she said, 'You will be saved; I will not.' "